A: Arbitration is a confidential legal process in which the decision is binding on and enforceable by the parties. The hearing however does not take place in a courtroom and the rules of evidence generally do not apply. A case is generally brought to final hearing faster in arbitration than a trial in court. 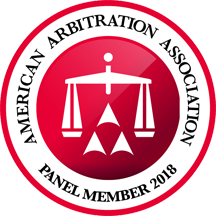 Q: What is an arbitrator? A: An arbitrator is the person who presides over the arbitration and makes the decision after hearing the evidence presented. Generally the arbitrator is selected by the parties from a list provided. In some cases more than one arbitrator presides over the arbitration. Q: When is a dispute heard before an arbitrator instead of a trial judge? A: In order for a case to be subject to arbitration, the parties must agree to have the dispute submitted to arbitration instead of being tried in court either by signing a contract that contains a binding arbitration clause or otherwise agreeing to submit to arbitration. Q: What are some usual benefits of arbitration vs. a trial in court? A: The arbitrator is generally selected from a list of persons knowledgeable about the subject matter of the dispute. The resolution of the dispute is faster than a trial in court. It is less expensive to resolve the matter. The process is less formal. Q: What is a mediator? A: A mediator is a neutral third-party who is trained to assist the parties in facilitating a resolution of their dispute. The mediator is often a lawyer but legal training is not required. A mediator can be designated by the court or selected by the parties. Unlike an arbitrator, a mediator does not have the authority to render a decision or issue an award. A: A decision is reached by the arbitrator after a hearing and the decision or award is binding on the parties. There is no hearing or award in mediation. Mediation is instead an informal process of meetings with the mediator and the other party(ies) in an effort to assist the parties in reaching a settlement. Mediation is not binding and either party can withdraw from the process at any time. Q: What are the usual benefits of mediation? A: The likelihood of compromise is usually greater through mediation as well as faster and more cost effective than proceeding to trial. The mediation process also allows the parties a forum to share non-legal frustrations and fashion a resolution that addresses them. Hostility among the parties can be diffused and an ongoing relationship more easily preserved through the mediation process.